From the day Quest opened, Erin Gregory's smiling face has caught my attention. So I decided to subject her to my Profile Questionnaire (actually done in person) in order to find out why she always appears to be really enjoying herself. If you've been to any of the many musical or fund raising events at Quest (and who hasn't? ), you've most often seen her behind the bar, slinging those pints to an eager crowd, or taking the time to describe the various beer styles currently on tap. Working at Quest was her first exposure to the craft beer world, up until that time she confesses to have been just a beer drinker. These days, while still taking her shifts pouring to customers or leading tours, she is the official Events Coordinator, responsible for the excellent music acts that hit the stage on Thursday nights as well as working with local community groups in fund-raising efforts and outreach programs. One special event in which she participated earlier this year was a Bottle Share to benefit Greenville Craft Beer Week, held upstairs at Barleys, which also coincided with the birthday of Brook Bristow, Esquire, known to most South Carolinians as the Craft Beer Legal Whiz Kid (that's another story entirely), an event I happily attended. Beers were shared, chocolate cake was eaten and hilarity ensued. Got the pix to prove it! The birthday boy himself, Brook Bristow, Esq. And I have spotted her several times representing Quest at the many craft beer festivals in the area, including Asheville. She's always happy to pour you a sample and to very capably describe the beer as well. She admits to not being a brewer but really enjoying meeting people and the camaraderie, the "friendly competition" found in the industry, on both sides of the bar. Which is not to say she doesn't have brewing experience. 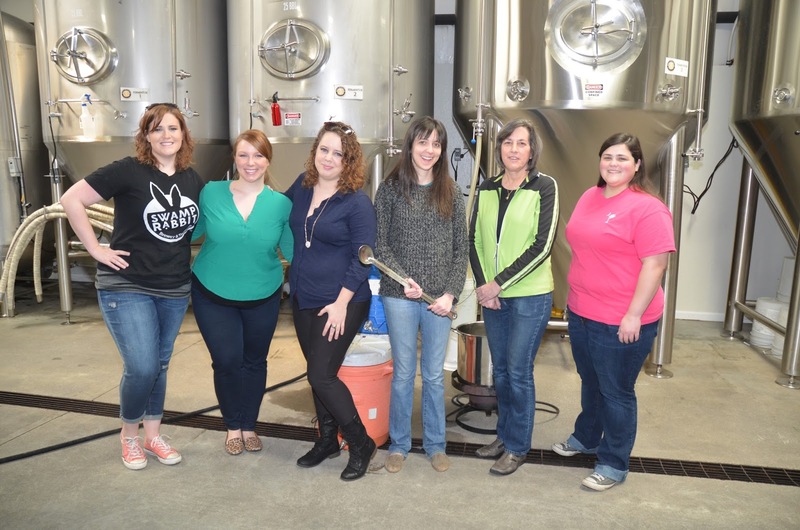 As her contribution to the Pink Boots Society's International Women's Collaboration Brew Day, Erin joined with some local ladies associated with the industry to brew this year's special recipe, a Red Ale. working in the craft beer industry. "Don't be afraid to try something new.... go for it" was part of her answer. She also cautioned that a newcomer at a startup brewery should expect to wear many hats and help wherever needed, just like she does. We'll have lots of opportunities in the coming months to catch Erin at work based on her calendar of upcoming Quest events which include their Third Bottle Release party on Oct. 30 which also fits into the Halloween festivities, a Black Beer Friday on the day after Thanksgiving when all the taps will feature Stouts and Porters, a Kaldi vertical tasting and even some plans for a New Years Eve event, tentatively titled "Brew Years Eve" and still in the planning stages. That'll keep her busy. And us busy, trying out all the one-offs and special cask night beers coming our way. I'm happy to say that I look forward to all that research I'm required to do! Thanks to Erin for her time, she's a busy lady. The Community Tap was the site (battleground, as it were) for the first ever Battle of the Beers, a fund-raiser for BreastFest Greenville. The rules were simple: three guys (Bennie, Chris, Chad), each choosing three beers in three categories, total of nine beers to sample. Participants voted on their favorites in each category, the guy with the most chosen selections wins! 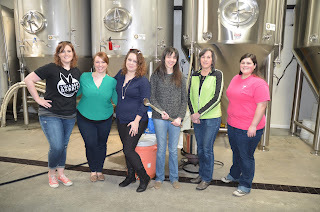 All good beers and all for a good cause, the upcoming BreastFest Greenville, scheduled for Oct. 24, 2015. A list of the beers is available at The Tap's Facebook page. The range was very impressive; from a Belgian Tripel Karmeliet whose recipe goes back to 1679, to a Pennsylvanian Imperial IPA Hop Bomb made by Victory. Surprisingly, my top choice for the evening was a new one for me, a New Belgium/Old Berseel collaboration called Transatlantic Kriek, a wheat ale with sour cherries blended in Colorado with a Belgian-style golden lager. Tart, yet with a slightly sweet finish and of course, cherry in the nose. Delicious. And the winner is.... Chris, center, for his inspired beer choices. Congrats! Very educational evening, I sampled four new beers. Untappd was very busy last night. 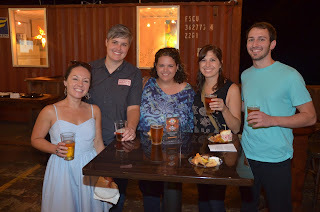 Adding my welcome to Croxbone Brewing Company's Brian and Nicole who have decided to move the operation to Greenville. 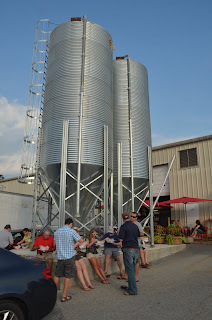 I had a chance to taste one of their brews at ‪#‎TheCommunityTap‬'s Craft Beer Fest '15, and remembered to take some photos. They've got a FB page (https://www.facebook.com/croxbonebrewing) so look them up for more information about the move. This was a very tasty, palate pleasing brew! 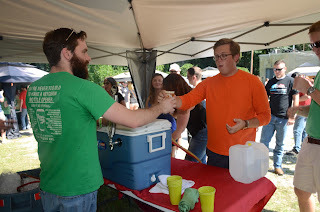 When I first met Andrew Myers in 2013, he was a owner/partner (with Leroy DuBré) at the Greenville Hop House, a retail store for all things brewing, home or otherwise. It was one of only two places in town where home brewers, trying to perfect their existing beer recipes or creating new ones, could get the malts, hops and other necessities to practice their hobby. When I stopped by the store, Andrew was very generous with his time as well as with his inventory - he donated some cocoa nibs for a beer project that I was about to be involved with. Andrew conducting a seminar at the first Greenville Beer Festival at Fluor Field. As I mentioned, there was a second outlet for brewing supplies in town, Thomas Creek Brewery, the city's oldest. Severing his partnership with Leroy, Andrew joined the TC team and combined their operations to offer the most complete inventory of brewing supplies available. He also managed to find time to pour samples and speak at various brew festivals in the area. 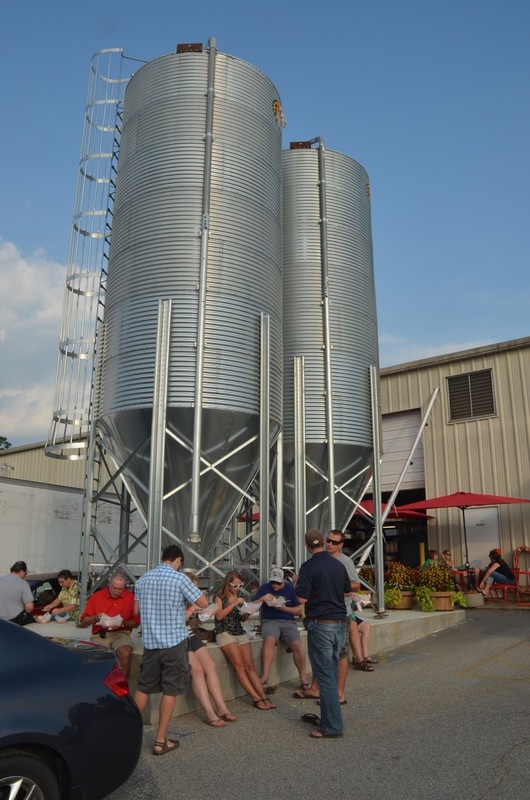 In Spring of this year, Andrew made his most recent move, to assist Ben Pierson, Owner/Brewmaster, at Swamp Rabbit Brewery and Taproom, in Travelers Rest, SC. Whether working as a tour guide at RJ Rockers Brewing in Spartanburg or brewing up the latest batch of Red Whitey at Swamp ( a Belgian white ale with raspberries, a Gold-Medal winner), Andrew has been and continues to be an interesting, experienced member of the Upstate Craft Beer community. And when asked about advice he gives newcomers to the craft, he'll tell them to visit a brewery, learn to appreciate the freshest beer, be willing to try new, unknown beers to find a style that they really enjoy. And then drink lots of it! With all the breweries we have in the area, I don't think that will be a problem.